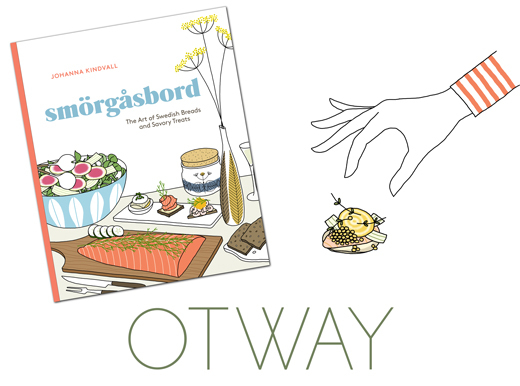 One year ago today my 2nd cookbook Smörgåsbord was published by the lovely people at Ten Speed Press. I wrote this book because I think the classic Swedish smörgåsbord is a perfect display of Nordic Cuisine, with dishes ranging from cured fish to small meatballs, including bread, butter, and cheese. It’s also a wonderful, traditional way to enjoy food with friends and family. This first year has been loads of fun meeting cooks, bakers and serious eaters. For example, last Autumn I hosted a special Smörgås dinner with chef Renee Baumann at 61 Local (Brooklyn) together with Jamie Schler I held a special Orange/ Smörgåsbord potluck party, and at Union Square market I shared bread and taught market visitors how to bake Swedish thin bread. I have also taught a smörgås/ smørrebrød class at Archestratus in Greenpoint and at COOKS in Philly I created a Smörgåsbord Christmas dinner together with cocktail duo Andre & Tenaya Darlington. And my neighborhood restaurant Otway with chef Clair Welle, cooked up a whole smörgåsbord menu to celebrate the book. I have really enjoyed talking and sharing breads and special treats with you all. 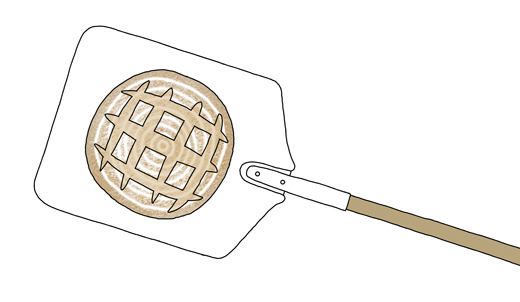 Thanks everyone for your support and curiosity to learn more about Scandinavian cooking. The 2nd year I will continue with more classes and dinners so please check my event page for updates. To celebrate, I’m sharing my Smörgåsbord recipe for parisare, which in the book is translated into the Swedish open-faced burger, as it simply is a burger without a top. A parisare (Parisian in English) is a Swedish retro classic with an unclear past. It might be related to something French but nobody seems to know the origin of this dish. The best parisare is made with the Swedish iconic biff à la Lindström, which are tasty patties spiced with pickled beets, capers, and mustard. Unlike a traditional burger, a parisare is assembled on a slice of toasted bread (preferable a light sourdough) and topped off with a sunny side egg, peppery garden cress (similar to mustard greens or watercress), and sprinkled with freshly ground white pepper. I also recommend frying the bread together with the patty which unite the bread and the meat into a perfect deliciousness (see recipe below). 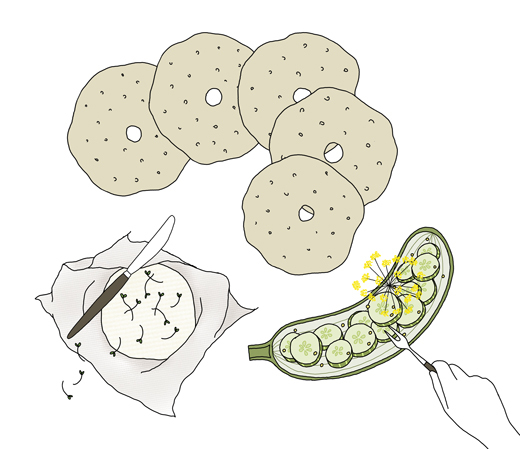 Serve parisare with roasted potatoes and condiments such as horseradish relish, pickled cucumber, and mustard. All these condiments are super easy to make and I share my simple recipes of all three in the book. If you bake or cook anything from the book, I would love to hear about it! Please leave a comment or tag me if you share it on social media. I’m @johannakindvall on instagram and @kokblog on twitter. You can also tag your bakes and dishes with #ArtofSmorgasbord. I will most likely share your post with the rest of my followers. In a small bowl, combine the beef, shallot, beets, capers, mustard, and egg. Add the salt and pepper and mix until evenly blended. To check the seasoning, take a small piece of the meat mixture and fry it in a pan; adjust the seasoning, if necessary. Prepare the ground meat mixture. Shape 4 large or 8 small flat patties. If necessary, cut the bread slices in half to match the patties; the patties will shrink slightly when cooked, so the individual bread slices can be slightly smaller than the meat. Place the patties on top of the bread and press them down a little so the meat sticks to the bread. In a large skillet, heat some butter and fry the patties over medium-high heat with the meat side down. When the meat is cooked through, 3 to 5 minutes, flip them over and cook until the bread side is a nice color, about 1 minute. Adjust the heat, if necessary. In a separate pan, fry the eggs in butter on one side, over low heat, for 3 to 4 minutes. Place the eggs on top of each patty and sprinkle with salt and pepper. Serve immediately. * Smörgåsbord has a simple and delicious recipe for pickled beets but you can also find these type of pickles in many well stocked supermarkets as well as in any Scandinavian or eastern European food shops. ** From the Smörgåsbord book, I suggest to use the Rustic Rye Bread (page 46) or the Cast Iron Whole Wheat Bread (page 43). You can also use this bread or this one (or any other light sourdough bread) . Reprinted with permission from Smörgåsbord by Johanna Kindvall, copyright © 2017, published by Ten Speed Press, an imprint of Penguin Random House LLC. the Smörgåsbord cookbook you can get it here. On this special evening, chef Clair Welle & the rest of the lovely team at Otway will, together with me, offer a special 5 course Smörgåsbord tasting addition to their regular menu. On the menu will also be my Open Faced Burger – which we in Sweden call Parisare (the Parisian). It’s a Swedish retro classic made simply with a beef & pickled beet pattie on toasted sourdough bread topped with a sunny side egg! Signed books will be available at a special price! Make sure to get a seat by booking your table here! Otway was recently announced as one of the best new restaurants in 2017 by New Yorker and Village Voice, and their Uni Crepe was listed by the NYTIMES. And their Yeast Semifreddo with Huckleberry & Rye is magnificent! Want to learn how to make Danish Rye Bread from scratch? Now’s your chance! On this special evening at Archestratus you will also learn how to make stove top fresh cheese, chicken salad with curry, and intense horseradish fish salad with quick pickles. Beer & a signed copy of Smörgåsbord are included in the ticket price ($80)! The meal will also include a few extra condiments from my book and something to bring home to share with your loved ones. It will be a hands-on cooking experience as well as a tasty meal with some new friends. Looking forward to cook with you! Looking forward to bake and cook with you! subway: G to Greenpoint Ave.
Archestratus is one of my favorite places here in Brooklyn. It’s a cookbook shop that also offers delicious Sicilian baked goods, coffee, tea, beer, & wine. And it’s also a space for classes, talks, book clubs, and more. And I love Paige’s arancini (Sicilian rice balls)! It’s the holiday season and time to get cozy with warming glögg and a stack of ginger cookies. Like many Swedes, I will be cooking up a traditional Swedish julbord. A julbord is a seasonal Smörgåsbord and something that most Swedes prepare for themselves and their loved ones every Christmas. If you’d like to learn more about the Swedish Christmas table, please read Larissa Zimberoff’s smörgåsbord story on NPR Salt. Along with everything I will be serving a selection of different kinds of breads that go well with the dishes on the table. One of the breads will be my vörtbröd (malted rye bread) from the Smörgåsbord cookbook (see recipe below). Traditionally a vörtbröd is baked with wort (malt extract from brewing beer), whole raisins and aromatic spices like orange zest powder, cardamom, cloves, and ginger. My version is baked with porter instead of the wort and, just because I don’t like soggy raisins, I first soak and mash them before adding it to the dough. This method makes an all through fruity flavored bread that is excellent with cured ham or cheeses like blue cheese. I wish you all a delicious holiday and a happy new year! with both classical and modern recipes. If you are thinking of remodeling your front facade I suggest your hire my friend Katie Merz. To prepare the sponge, place the rye flour in a large bowl. In a small saucepan, bring the water to a boil, then remove it from the heat, and pour it over the flour. Work the flour and water well together to create a thick porridge like batter. Set aside to cool. When the scalded rye flour has cooled completely, add the sourdough starter and mix well. Cover the bowl with a dampened tea towel and let sit at room temperature for 8 hours or overnight. To prepare the soaker, in a bowl, soak the raisins, orange powder, cloves, ginger, and cardamom with the porter, then cover and let sit at room temperature for 8 hours or overnight. In a blender or food processor, mix the soaker until smooth and sticky. To prepare the dough, in a large bowl, combine the sponge and pureed raisins with the all-purpose flour and salt. Transfer the dough to a floured flat surface and knead the bread into a ball, about 1 minute. If the dough sticks to your hands, wet them before kneading the mixture together. The dough will be dense and tacky. Place the dough in a large bowl, cover with a dampened tea towel, and let rise for 3 hours. Shape the dough into 1 oblong loaf, following the directions on page 21. Place it in a well-floured rectangular proofing basket that is approximately 12 by 5 inches (30 by 13 cm). You can also let it rise on a well-floured tea towel supported with two rolled-up tea towels on either side of the loaf (see diagram below). Cover with a dry tea towel and let rise for another 2 hours. To test when the bread is ready to bake, poke your finger gently into the dough; the indent should slowly spring back, about 3 seconds. When ready to bake, carefully invert the shaped loaf onto the hot baking sheet (or stone). With a sharp knife or razor blade, slash the top of the dough. Mist the bread with a water spritzer before closing the oven door. Lower the temperature to 400°F (200°C) and bake for 40 to 50 minutes, or until the internal temperature reaches 208°F (98°C). The bread should have a dark brown color, and if you knock at the bottom of the loaf, it should have a hollow sound. Remove from the oven, cover with a tea towel, and let the bread cool completely on a cooling rack before cutting the bread. It’s best if the bread can rest for at least 8 hours or overnight. The bread will keep fresh for several days, at room temperature, covered in a plastic bag. For longer storage, freeze bread when cool, well wrapped in plastic, sliced or whole, for up to 3 months. Orange zest powder is simply made by drying the outer layer of the orange in a sunny spot for a couple of days or in the oven at 200°F (95 °C) for 1 hour. The orange skin is easy to peel with a potato peeler and, to make the drying go faster, cut the peels into thin strips. When the peel is dry, place them in a coffee grinder or food processor and pulse until you have a nice orange powder. Use the powder to flavor bread, cakes, and stews. Animation of the cover of Smörgåsbord – The Art of Swedish Breads and Savory Treats, Ten Speed Press 2017. In my latest cookbook, Smörgåsbord: The Art of Swedish Breads and Savory Treats, I want to encourage you to make small portions of a classic Swedish Smörgåsbord. A little like a Smörgåsbord tapas! Together with a flavorful bread, it’s a concept that works for everyday smörgås (open-faced sandwich) meals as well as for festive starters. The first chapter is dedicated to Nordic breads, both classic and new creations, baked with either yeast or sourdough starter. As rye bread is the most distinctive type of bread throughout the northern countries, I have included five different types. But there are some tasty wheat based breads too and a stove-top baked flatbread made with barley flour. The rest of the chapters concentrate on spreads and toppings you can serve with the breads for every day smörgås, seasonal treats or more festive occasions. The last chapter is where you will find condiments like pickles, whole grain mustard, crispy onions, and classic sauces. It’s that addition that can turn any dish or open-faced sandwich into something more special. 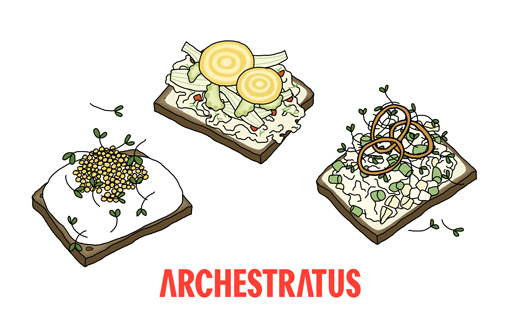 In my opinion the best smörgås is built up with several combined toppings. 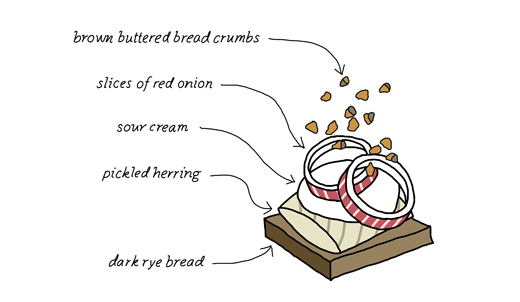 Pickled Herring with Sour Cream, Red onions & Brown Buttered Bread Crumbs – Pickled herring is a staple in Sweden and comes in many different flavors, either in vinegar or with cream. I love herring and like many Swedes I eat it all year around. In the book I share two of my favorites, a creamy mustard herring and a vinegar based herring spiced with rhubarb, cloves, and cinnamon. 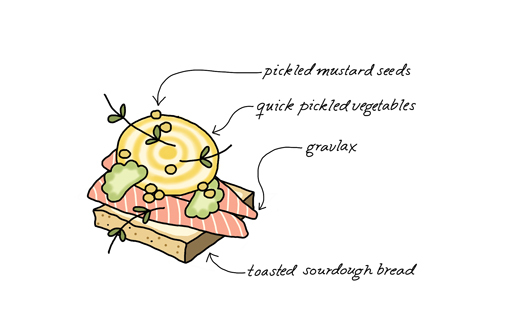 Gravlax on Toasted Sourdough Bread topped with Fresh Pickled Vegetables and Pickled Mustard Seeds – If you plan ahead, gravlax is a simple and festive smörgås topping that can be flavored and paired in many different ways. The most classic is to serve it with simple mustard sauce or as in Finland with Fresh Pickled Cucumber (pressgurka). My version of gravlax is cured with fennel seeds and I warmly recommend it served on toasted sourdough bread and topped with Quick Pickled Vegetables and Pickled Mustard Seeds. (You can find all these recipes in the book). Roast Beef with Danish Remoulade and Crispy Onions on Danish Rye Bread – This is a very common smörgås or smørrebrød combination in both Sweden and Denmark. 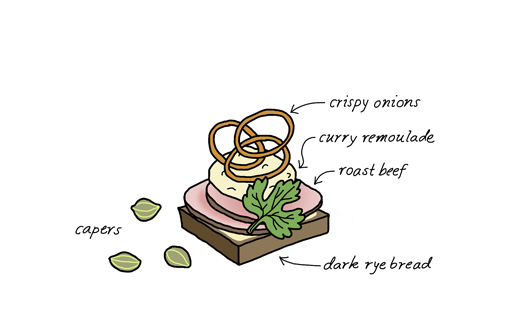 The remoulade, which is a mayonnaise based sauce spiced with curry, pickles, capers, parsley and tarragon, is simply whipped together and pairs surprisingly well with roast beef and crispy onions (rostad lök). The Danish rye bread, baked with loads of whole rye berries, sunflower seeds, flax seeds, and toasted sesame seeds, is a delicious and wholesome bread. Instead of roast beef, I’m sure this little treat can easily be done with some leftover Thanksgiving turkey. For every recipe in the book you will find several more pairing suggestions. I hope you will find it useful and inspiring enough to find your own special Smörgås combinations. And there is of course always the option to create a whole feast too! If you plan it well, it doesn’t have to be that complicated and for many dishes like cured ham, gravlax, and pickles most of the process takes place when you are at work or doing other things. If you bake or cook anything from the book, I would love to see it! Please share it with me here in the comments or tag it with #ArtofSmorgasbord on instagram, twitter, or facebook. A selection will be re-posted or linked to here on kokblog. Don’t have your own copy of Smörgåsbord? You can get it in almost any bookstore online all over the world! Here are a selection of bookstores… Random House, Barnes & Noble, Indie Bound, Amazon (US), and Amazon (UK).